BUCKSPORT, ME – Central Maine Cold Storage is now open for business. The privately funded company formally unveiled its $2 million state-of-the-art, on-demand seafood freezing, packaging, and storage facility on Oct. 9 during a ribbon-cutting ceremony attend by Gov. Paul LePage. The company is offering IQF (individually quick frozen) and blast freezing processes for all food-grade seafood products, as well as bulky items such as bait. 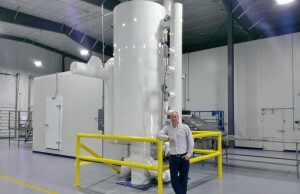 It also offers long-term storage in its 135,000-cubic-foot freezer. Among the driving motivations for building the facility, according to CEO Brian McCarthy, was a desire to provide close-to-home services to local businesses that have been transporting seafood products across the border for freezing. “We want to work with those customers with a current frozen product who are getting that process done in Canada,” McCarthy said. 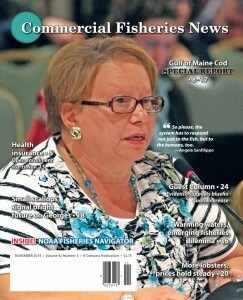 He added that 60%-70% of value-added processes for Maine seafood now take place in Canada. Read the rest of these stories and much, much more in the November issue of Commercial Fisheries News.